Steve Cowell as Francis Henshall in Hasland Theatre Company's production of One Man, Two Guvnors. Hasland Theatre Company’s cast of One Man Two Guvnors have taken part in a workshop led by professional clown Mark Curtis in order to embrace their inner clown. One Man Two Guvnors is an adaptation of an eighteenth century commedia dell’arte play by Carlo Goldoni. Richard Bean’s hilarious version was a huge success in the West End, starring James Corden as the central character of Francis Henshall, who ends up in complete confusion, working for two different bosses at the same time in 1960s Brighton. Director Heather Cowley, who initially met Mark at a two day workshop with the RSC in Stratford said: “This play requires many skills from the cast including singing, great comic timing and the ability to completely let go on stage. Mark’s clowning workshop really helped the cast to hone their skills in creative freedom and general daftness! One Man Two Guvnors by Richard Bean is on at Hasland Theatre Company’s playhouse on Storforth Lane, Hasland, from Monday, January 23, to Saturday, January 28 at 7.30pm. 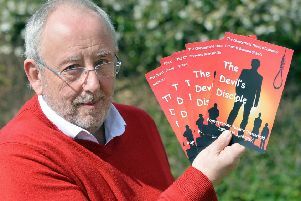 Tickets are now on sale £8.50 from www.haslandtheatrecompany.co.uk or by calling the box office on 01246 272271.
n Pictured is Steve Cowley who plays Francis Henshall in Hasland’s production. Photo by Christine Aldred.